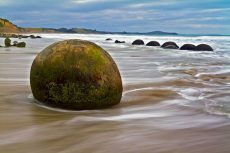 The boulders are located on Koekohe Beach, between the towns of Moeraki and Hampden. It is an easy (and very scenic) drive on State Highway 1 from the north or south. The Moeraki Boulders are 209km (2.5 hours) from Cromwell and 185km (over 2 hours) from Alexandra. Hi are there any tours there for disabled wheelchair users? Does the gift shop still sell stainless steele fish by Jono taiperi Plains? Noeline. Hello there, we are traveling to Oamaru on April 1st and wish to visit the Moeraki Boulders. but we can’t drive. Are there any day tours recommendations from Oamaru? Thanks. Could you please advise, what is the reasonable tide height, in cm., that still allow to see Moeraki Boulders? Are the Moeraki Boulders open to the public on Good Friday, 2016? Couod you tell me how to get to Moeraki Boulders from Oamaru by bus? Becayse I can not drive a car by myself. I have read that the boulders can only be seen during low tide. I wonder how low the tide needs to be? 0.4m is the lowest it will go on the day I am planning to visit. If I am there, say one hour earlier than the lowest tide (some 0.5m or 0.6m) will it still be good? Thanks! I am planing a New Zealand trip now . and I have found this website to check the tide. Couod you tell me how to get to Moeraki Boulders from Dunedin by bus? Becayse I can not drive a car by myself. I am going to Moeraki boulder in Dec 18. When will be the low tide period during that day? could someone phonetically spell out how to say Moeraki and Koekohe. I love these boulders and paint them obsessively. I saw a picture of them once and fell in love. Hi, phonetically Moeraki is something like moy raakey, so draw out the ‘a’ sound in the middle. Hope that helps!! I wish to go there but i don’t know how to drive. Is there any tour i can join and depart from Oamaru? have a fab time, the boulders are great! I´m planing a holiday in new zealand in December 2012. I want to visit the moeraki boulders, but I´ve read, that they are only to see on low tide. Can you tell me, when there will be low tide (from 16.12. – 18.12.) ? Or can you tell me where I can found a “low tide callendar” ?